We, at Manav Rachna, believe that the idiom ‘All work and no play makes one dull’ holds true for the young learners as well. Play is integral to Early Years learning and development. Sports, whether team-based or individual, are great for children as they provide not just physical activity, but also help build children’s self-esteem, confidence, social skills, team-spirit and motivate them to excel in life. 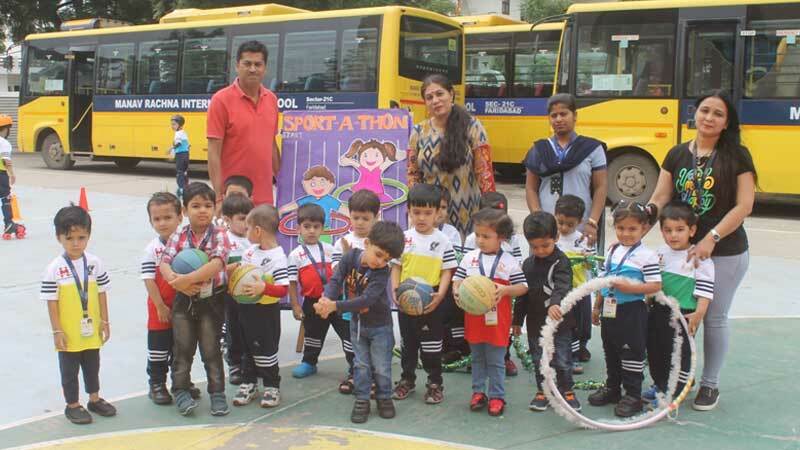 Keeping the same in mind, we at MRIS 21C Faridabad organized Sport-a-Thon for children of Early Years. Children participated in multifarious engaging and innovative games like ‘Ball in the Ring, ‘The Track Jump’, ‘Basket the Hoopla’, ‘Cross the Hurdle’, ‘Hoopla Hop’ and many more. The objective of this activity was for children to build positive associations with outdoor games, strengthen various gross motor skills, cheer for and learn from each other. It was a delight to witness the children participating with excitement, energy and having oodles of fun.